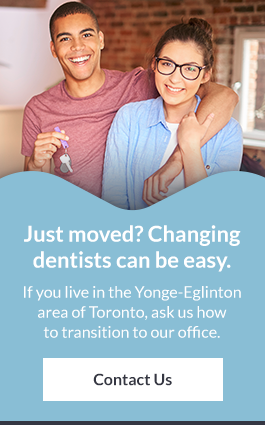 Looking for cosmetic dental services at Yonge-Eglinton in Toronto? Get the look of a healthy smile at Capitol Dentistry. We offer cosmetic dental treatment including teeth whitening, veneers, inlays and onlays, and bonding. We believe that a healthy-looking smile leaves a lasting impression. Make your smile shine. Whitening is easy and can improve the overall look of your smile with minimal invasion to your smile. Many people consider teeth whitening before a big event, like a wedding. Ask us about in-office or at-home whitening for your smile. We will customize your treatment based on your needs. Bonding techniques can work to close gaps, and eliminate spots or discolourations in your smile. We use materials that match the shade, translucency and texture of your teeth, resulting in a natural, more aesthetically pleasing smile in just one dental visit. Porcelain veneers are thin, custom-made covers that are placed over your teeth in a two-step process over two appointments. Used to improve the overall appearance of your teeth, veneers can mask problems such as dark, discoloured, stained, and crooked teeth. Inlays and onlays are custom-made fillings that help correct chipped, broken, misshaped, asymmetrical or decayed and damaged teeth. Because they’re made just for you, inlays and onlays match the original shape of your tooth and are almost indistinguishable from your natural tooth enamel. You can transform your look with a smile makeover. We will understand your needs, analyze your smile and provide you with a recommendation of services that can help improve the look of your smile. We combine our cosmetic services to get you your desired results. Are cosmetic dental procedures covered by insurance? Many dental plans do not cover cosmetic dental treatments. However, if you are unsure about what your plan covers, we recommend reaching out to your insurance provider for clarification.